This is always a problem for my students. Understanding the French school system, l’école française, knowing which grades are which is a real nightmare. So here is a post that should make things easier. I wrote the equivalent grades in the US/UK school system, and the age of the students for reference. Navigating the French school system and the equivalent US/UK grades can be tricky. Here’s a list of each grade as well as related French school vocabulary and French school supply vocabulary. Read my thoughts about switching from an American to a French preschool system. The age indicated in this article is the minimum age you are supposed to be when entering that grade. Of course, it’s a bit flexible: Leyla is from November, so we had a choice: she could have been one of the youngest or one of the oldest in her class. With the agreement of the school director, she joined CP at 5, turning 6 in November and therefore finishing that grade age 6. It could be the contrary as well: kids entering CP at 6, turning 7 that year: it’s the majority of the cases. And some kids also repeat years. Of course, there are always unique cases. 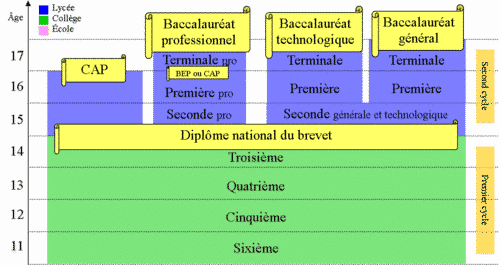 The collège ends with a test called “le brevet“. Le lycée can be in general studies, with some specialty as in languages or sciences, leading to the diploma of Baccalauréat général (commonly called “le bac” – do say the “c”), or prepare you for a special trade (hairdresser, a cook, mechanic…) leading to CAP or BEP diplomas – you can stop at 16 years old – or to a Baccalauréat technologique. Studies in France are compulsory until you reach 16 years old, but they can be in school or in some kind of study/apprentice program. La seconde (15 ans) = 10th grade (Year 11 UK). La première (16 ans) = 11th grade (Year 12 UK). La terminale (17 ans) = 12th grade (Year 13 UK). They then go for “des études supérieures” (higher studies) à la fac, à l’université (watch out this is college…) or in les Grandes Écoles (the French Ivy League: SciencePo, HEC, more… ). 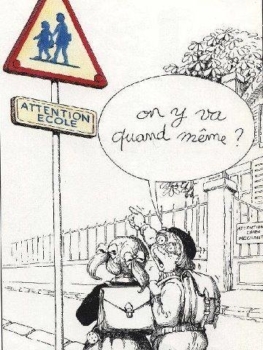 You need to have le baccalauréat to get into these schools, and Les Grandes Écoles often require that you have “une mention” (honors of the jury) to get in, or than you pass a special test. 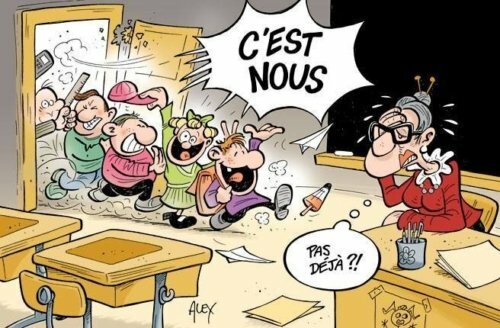 “Le homeschooling” (yes, we use the English word) is not illegal in France, but extremely rare. Most children that are home-schooled are so because their parents are traveling, or because the kids have a medical condition. Homeschooling parents have to register with the school authorities and potentially face yearly inspections/evaluations to make sure the children keep up with French educational standards. Suivre un cours de français/ une classe de français – to take a French class – watch out, you can’t say “un cours français/ une classe française”, it’s a class OF French (language) in French, the class itself is not French – more in this blog article. – Are we still going? Un stylo plume – an fountain pen (ink) – yes, French kids still use these! Voilà, I hope you’ll find this article useful. Learn French in context! 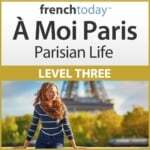 My audiobook A Moi Paris Level 1 has a chapter about elementary school (ch 17), and in A Moi Paris Level 4 chapter 1 describes a typical day at the university.